April 4, 2017, New Delhi:It is that time of the year when the exams have gotten over and the new sessions are getting started in schools. It is also the time when schools issue their fee bills for the next session. The fee increase in many schools has again been quite high this year and parents in different parts of the country have come on to the roads to protest about it. They have also been complaining about the hefty increase in the annual fee charges which schools are not able to justify. Citizen engagement platform LocalCircles, had conducted a survey in September 2016 on school fee disclosure, post which CBSE mandated disclosure of the fee by schools to CBSE, and on the school’s websites. As per the last notification from CBSE, only 14,000 out of the total 18,000 schools had complied with the order. 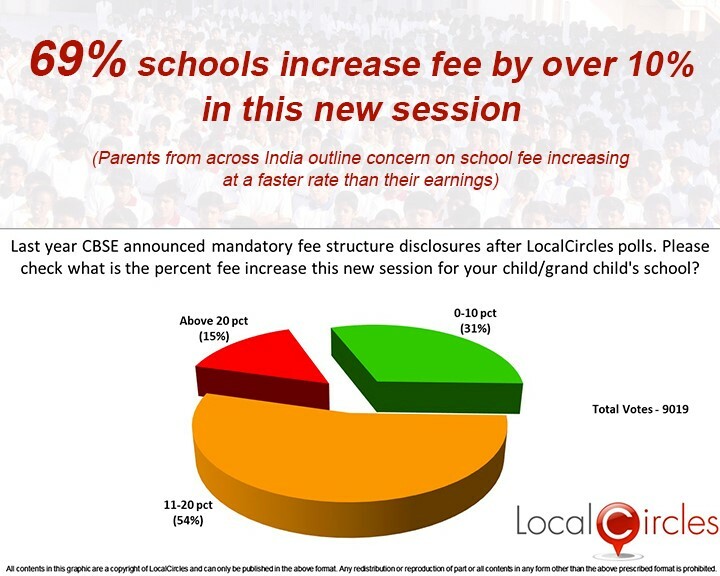 As the chatter in various national and local circles started gathering momentum, LocalCircles conducted another survey and asked citizens by what percentage has their child or grandchild’s school increased the fees for the coming session. With more than 9000 parents/grandparents voting on this, a large 54% said that their school has increased the fee between 11 – 20 percent. 15% said that the increase was above 20 percent and 31% said that the increase was between 0 -10 percent. LocalCircles also conducted this survey in 17 states in India on this issue and the results were not surprising. More than 75% parents from Haryana, Andhra Pradesh, Kerala, West Bengal, Rajasthan, Uttarakhand, Jharkhand and Goa said that their child’s school has increased the fee by more than 10%. 50 -75% parents from the states of Uttar Pradesh, Maharashtra, Madhya Pradesh, Telangana, Karnataka, Tamil Nadu and Delhi said that fee hike has been more than 10%. Only Gujarat and Bihar were the two states where parents said that majority of the schools have increased the fee by less than 10%. LocalCircles also interacted with some school principals who have capped their fee increase to less than 10% and asked them how they were able to do it. They said that in the last few months, they have focused on optimizing their costs, negotiated with their vendor base and also looked at reducing wastage of resources. As a result, they were able to keep the fee increase to the permissible levels. Parents across the country are very concerned as school fees in the last years has been rising at a much faster rate than the average earnings of the parents thereby creating a squeeze. In last year structured discussion, many parents admitted to cutting discretionary and household expenses to be able to afford their child’s school education. LocalCircles will be sharing the results of this report with Department of School Education - MHRD, CBSE, Department of Consumer Affairs, State Chief Ministers and District Magistrates. The key ask is to limit the annual school fee increase to 10%. 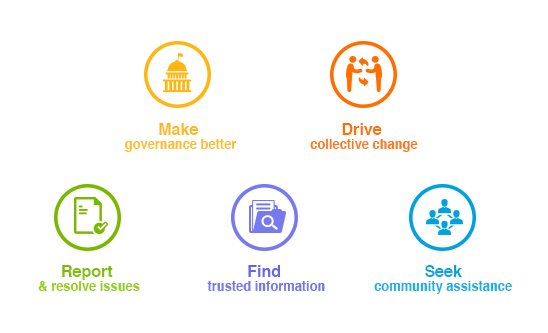 6 months ago, LocalCircles had also conducted the polls below to understand citizen pulse and to drive broader reforms in school fee administration and operating models. Some have already been acted upon by boards like CBSE while some others are under consideration.